Long before she became captain of the Elizabeth Jean, Lal earned the position of Inspector General. During her 26 day passage to French Polynesia, her attention to detail in the care and tending of Pax Vobiscum caught the Bagshaws’ eye. They named her. The name stuck. With similar care, the Inspector General oversees Elizabeth Jean‘s decommissioning and recommissioning each season. Every boat system has its list. 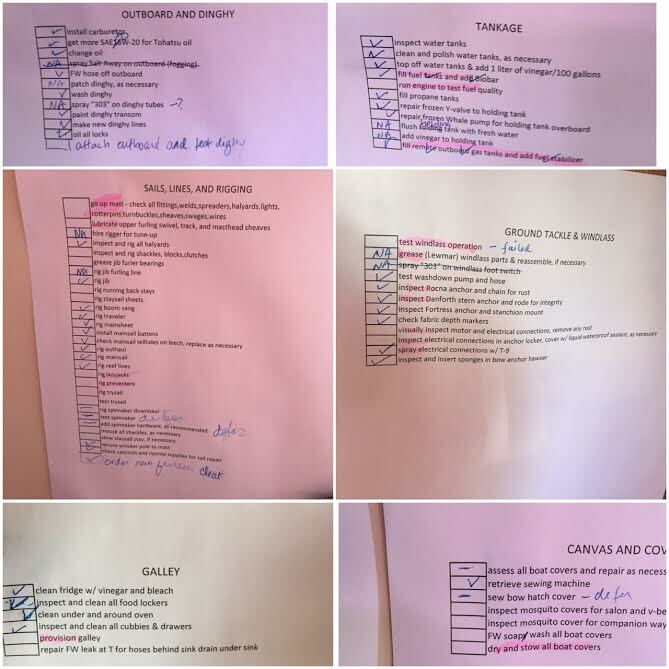 Tasks total almost two hundred. No. We don’t necessarily perform every task each time we recommission. For example, adjusting the engine’s nozzle spray occurs every couple years. But tasks deferred are more than made up for by those not anticipated. Lists for (a) outboard and dinghy, (b) tankage, (c) ground tackle & windlass, (d) canvas and covers, (e) galley, and (f) sails, lines, and rigging. 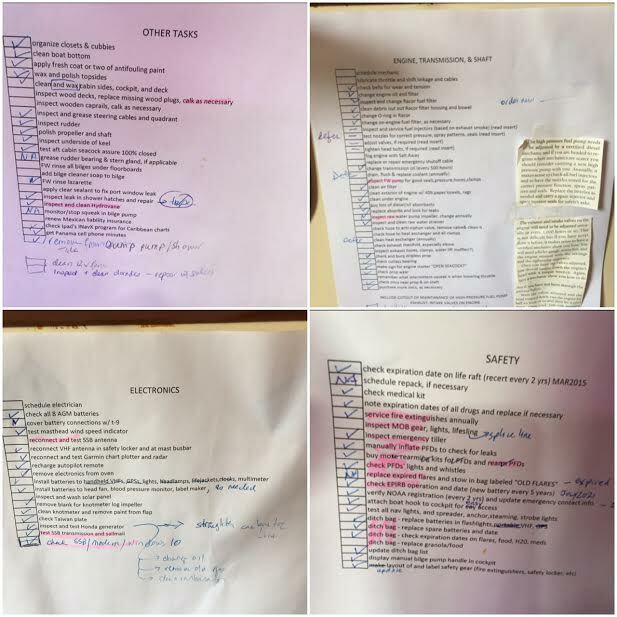 Lists for (a) other tasks, (b) engine, (c) transmission and shaft, (d) electronics, and (e) safety. At this point, the Inspector General is checking her lists twice. If we’ve been good, we will be able to leave port soon. The Inspector General hard at work. It’s an old saw that cruising boils down to working on boat projects in exotic locations. A corollary to this adage is that cruising includes the opportunity to work with local crafts men and women while working on boat projects in exotic locations. Thus, begins our tale of two tailors. Tailor number one, answers to Eric, Slash, or other assorted names too salty to post for a polite audience. 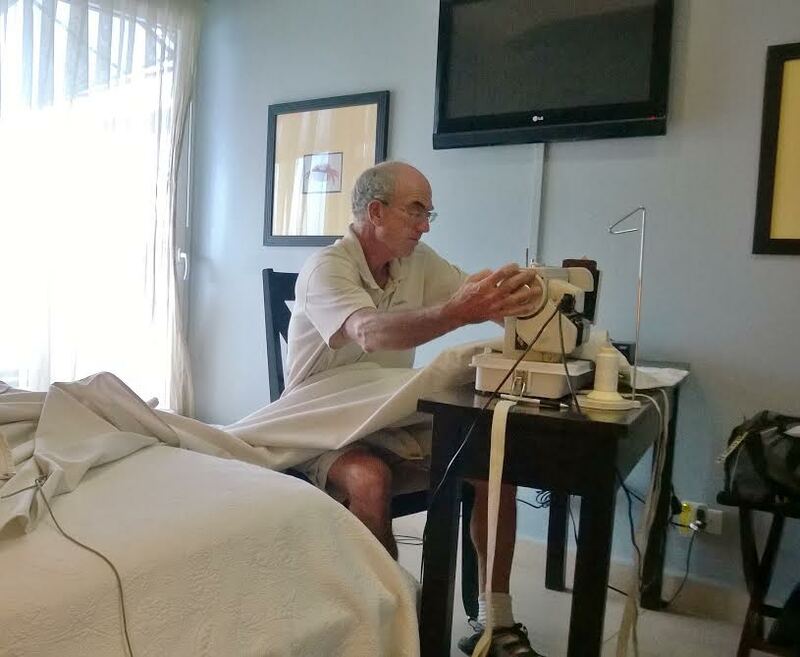 Eric began sewing camping gear in the ’70’s, graduated to Halloween costumes for Beth and Jean, and morphed into Elizabeth Jean‘s on board canvas wright. His credits include helm, windlass, hydrovane, outboard, winch, life raft and handrail covers. His grandest project, however, would not have been possible without Tailor number two. 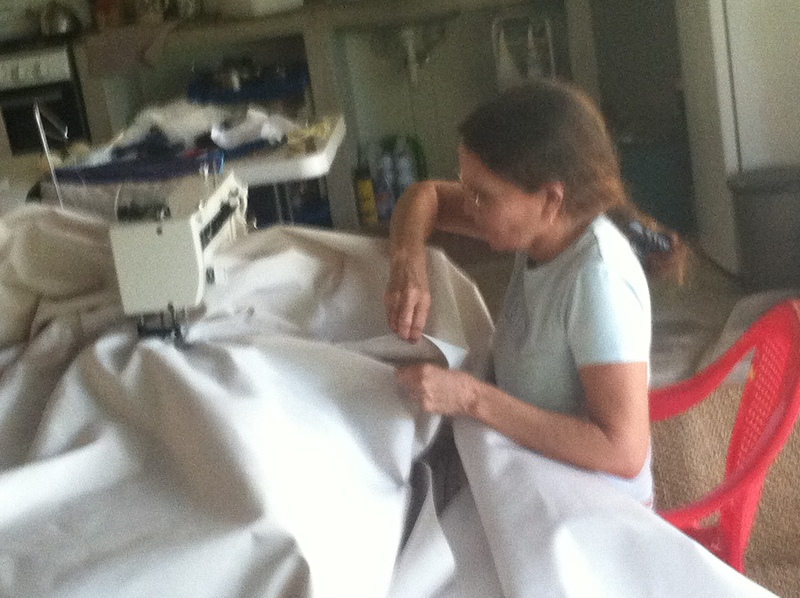 Isabel Arce, an El Salvadorean seamstress (aka Tailor number 2), crossed our path after we crossed the bar in to Bahia de Sol El Salvador, an exotic location if we’ve ever seen one. 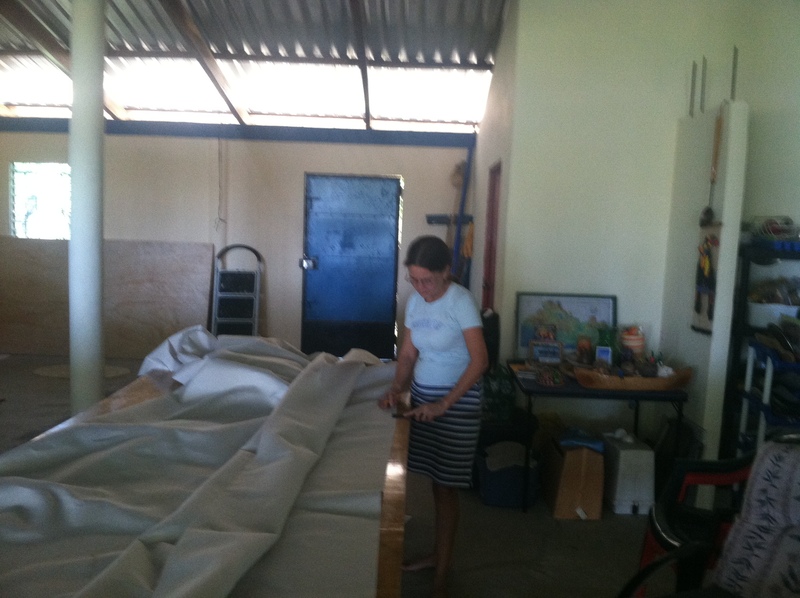 Together Isabelle and Eric began assembling the long panels needed for Elizabeth Jean’s summer boat cover. In the process, Isabelle helped Eric with his Spanish as Eric helped Isabel with her English. While we were waiting to transit the Panama Canal, Eric resumed work on the project, completing it the day we left Elizabeth Jean for the summer. Elizabeth Jean surfing the bar into Bahia del Sol, Ecuador. Tailor #1’s canvas work. 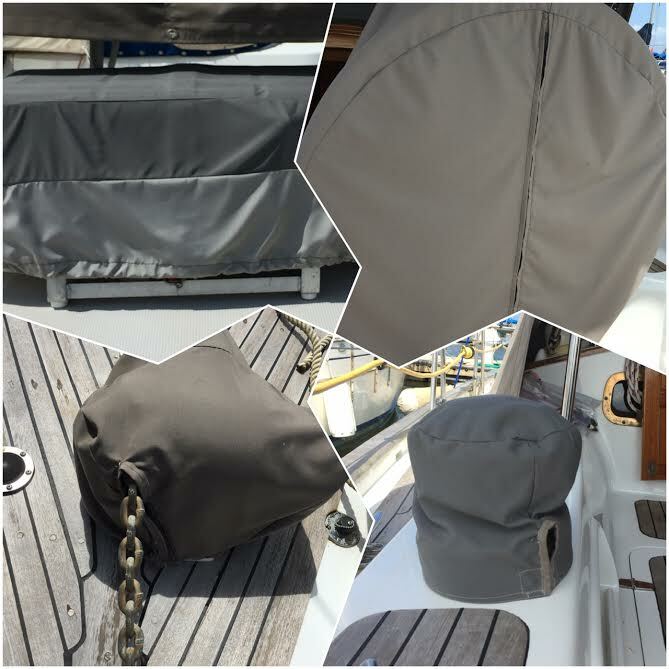 Clockwise from upper right: life raft cover, helm cover, winch cover, and windlass cover. Bill and Jean, the hosts of the El Salvador Cruisers Rally, offered their home to start the project. This shot conveys how long the canvas pieces are. Information about the Cruisers’ Rally and Bahia del Sol can be found at this link. Isabel joining two large panels together. Eric, in our room at the Shelter Bay Marina, putting the finishing touches on the awning before our May departure. Elizabeth Jean on the way to the storage yard in her new summer finery. 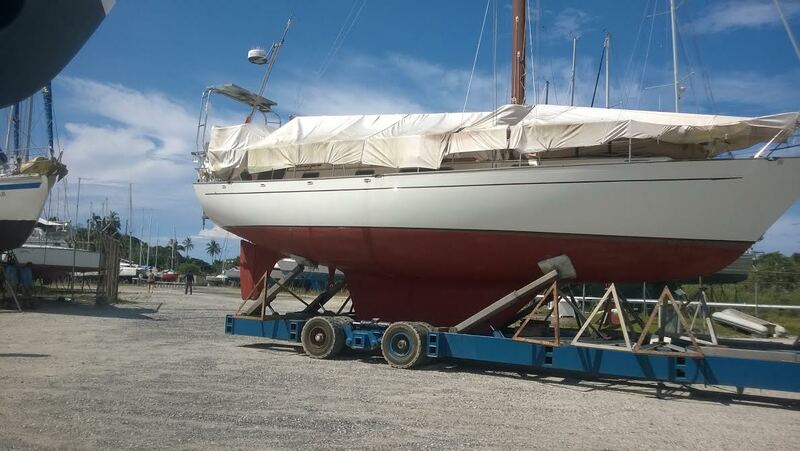 Five months later, we have returned her to the water and are washing and stowing the covers. 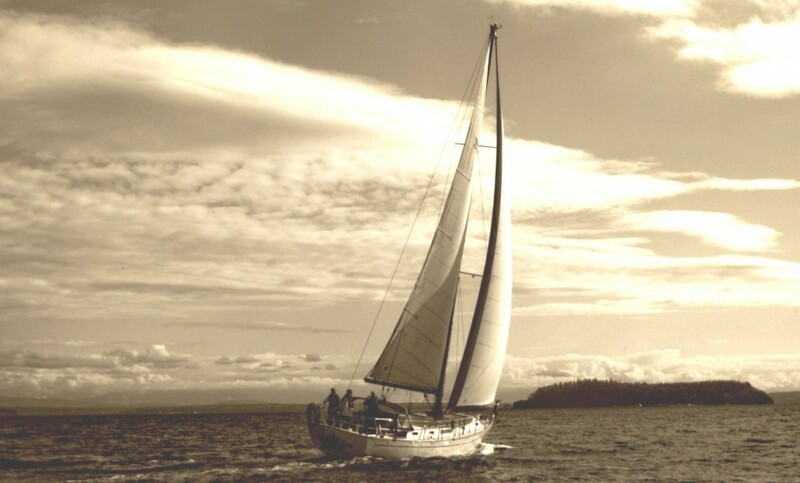 Those readers interested in cruiser canvas work, multi-cultural boat projects or both will enjoy the story of Memory Rose’s crew. They were so inspired by the sailing canoes of the San Blas, Kuna Indians that they opened a small sail loft in Panama and began sewing canoe sails. We head to the San Blas next and will be keeping an eye out for Memory Rose‘s work. 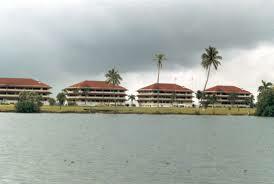 Shelter Bay Marina, Elizabeth Jean‘s home from April to November, is re-purposed U.S. military base, Fort Sherman. The Fort dates back to 1912. Constructed concurrently with the Panama Canal, Fort Sherman included coastal defense guns as well as barracks for troops to defend against a direct assault. 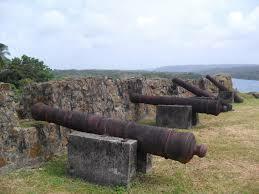 The Fort included 23,100 acres of land, about half of which was covered by jungle. The U.S. operated the Jungle Operations Training Center from the Fort beginning in 1953. The Center was an important training base during the Vietnam War. 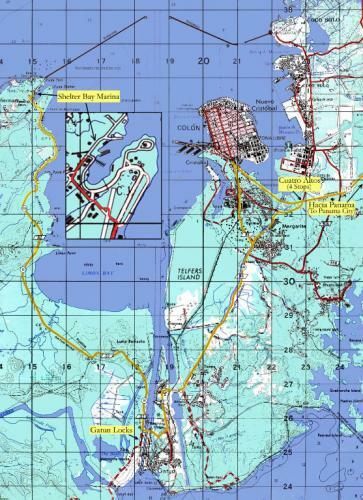 As part of the process of turning the Canal over to Panama, the U.S. turned the base over to Panama in 1999. The jungle is reclaiming much of the Fort, although the Panamanian military continues to use part of the site. With Veterans Day just passed and armed conflict continually in the news, our stay in this tranquil spot is particularly poignant. Shelter Bay is located on the tip of the point to the left across the bay from Colon. This remote location served the Fort’s military purposes well. 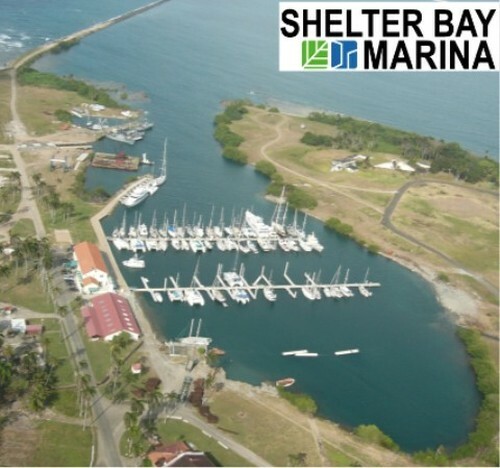 The marina offers twice daily shuttles to Colon, the nearest area for provisioning and boat supplies. The Albatross-eye view of Shelter Bay Marina’s location before the marina was built. View from the northwest (lower left corner). Old batteries; no longer present. The Albatross-eye view of Shelter Bay Marina. View from south (bottom of picture) to north. Two more docks have been added since this picture was taken. 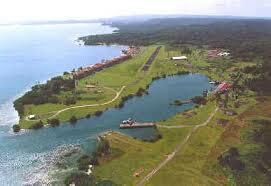 The Panamanian military continues to operate out of these buildings. 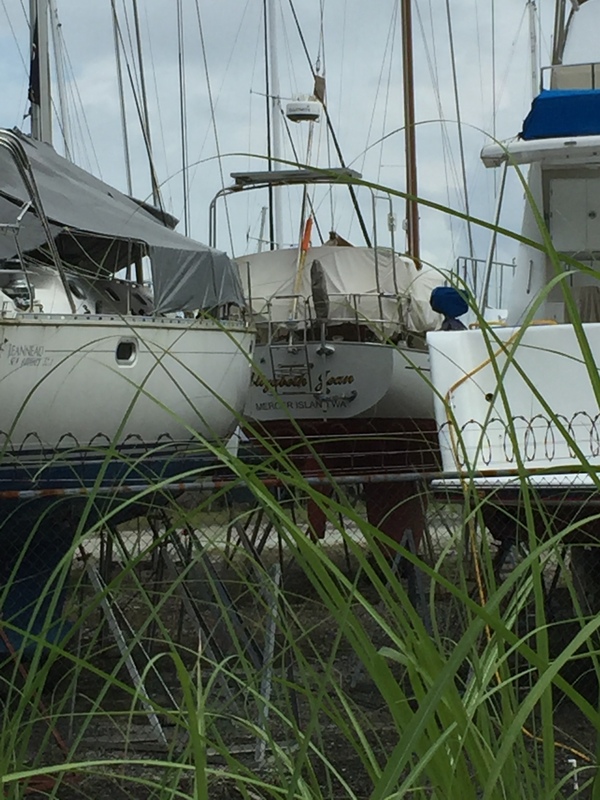 We returned to Shelter Bay Marina yesterday after a drive from Panama City that passed parts of the new canal locks. Elizabeth Jean moves from the secure yard to the work yard this afternoon. Can’t wait to be with her again! 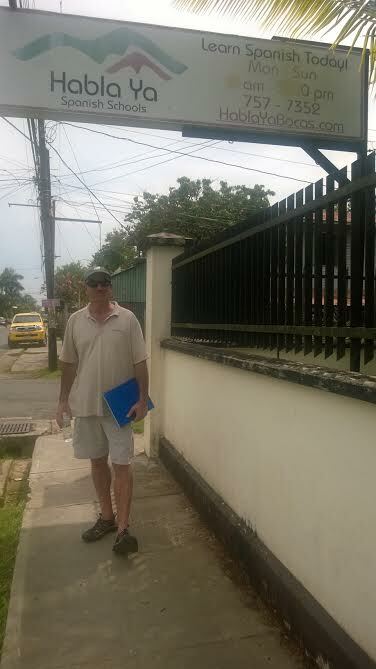 Actually, we faithfully attended classes all this week each day from 8:00-12:00 in Bocas del Toro. 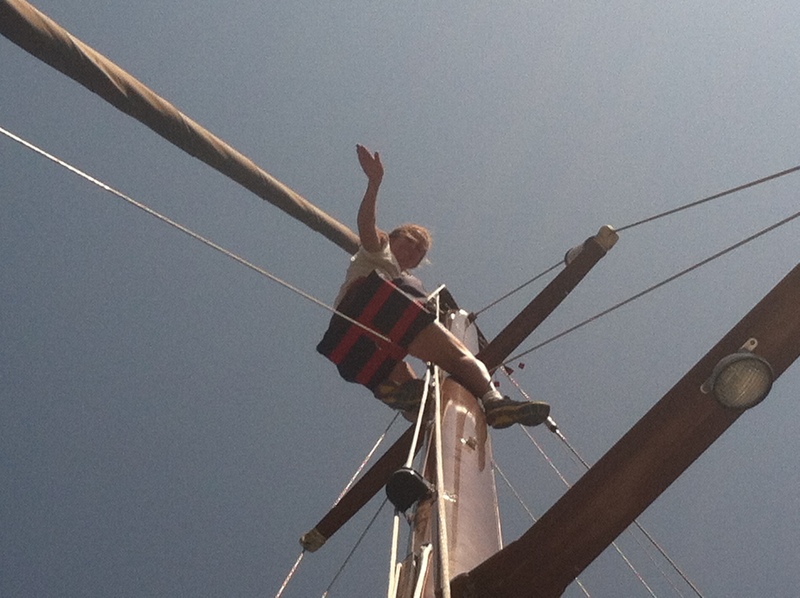 After class we have enjoyed seeing some of the sights and visiting our friends who have their boats in the local marina. 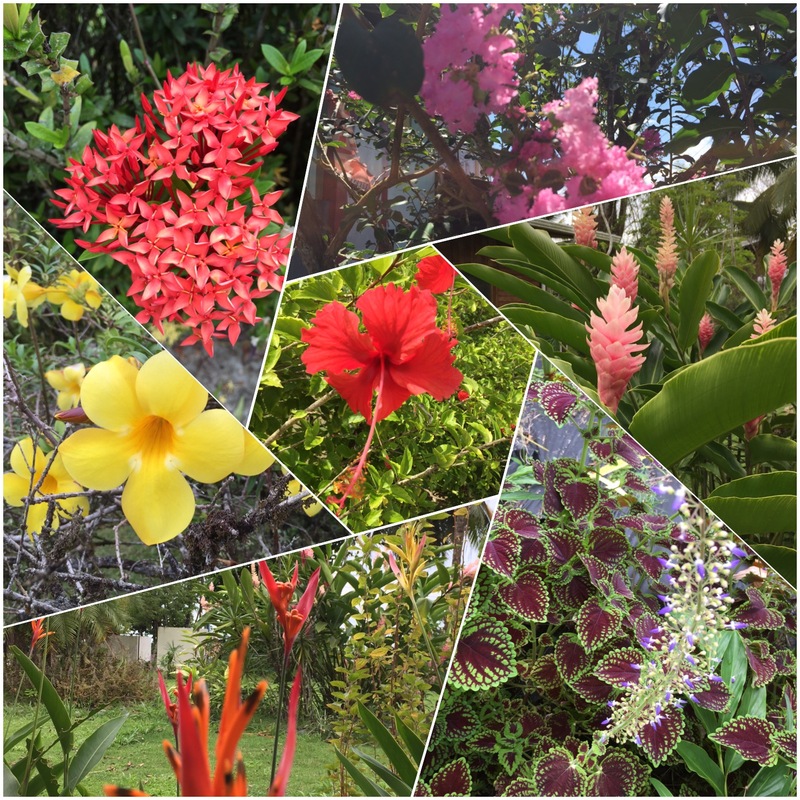 Coming out of the raining season the flowers are happy. Habla Ya offers classes in Boquette, Panama City and Bocas del Toro. The school is well run and the teachers we had were excellent. 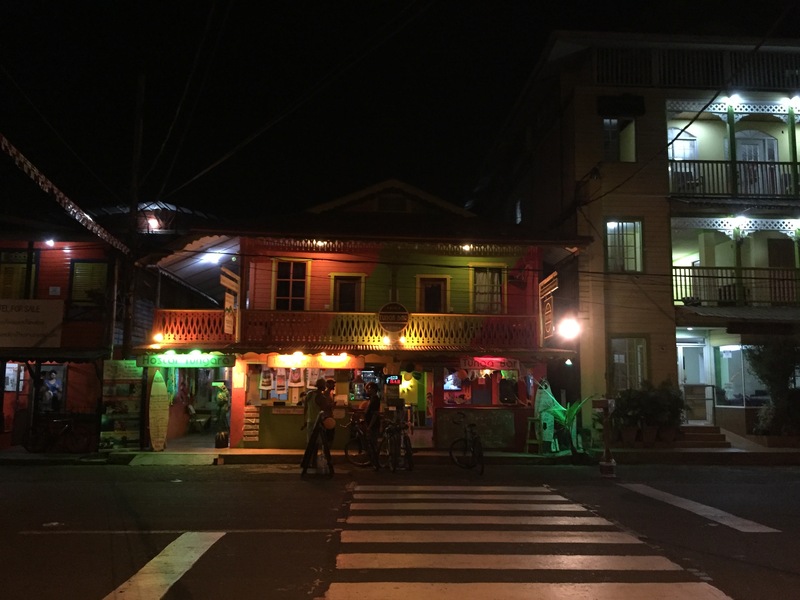 We chose Bocas, a ten hour bus ride and water taxi ride from Panama City, because we had cruising friends working on their boats there and we thought we might miss them and the town, as it is in the opposite direction of our planned cruising route. 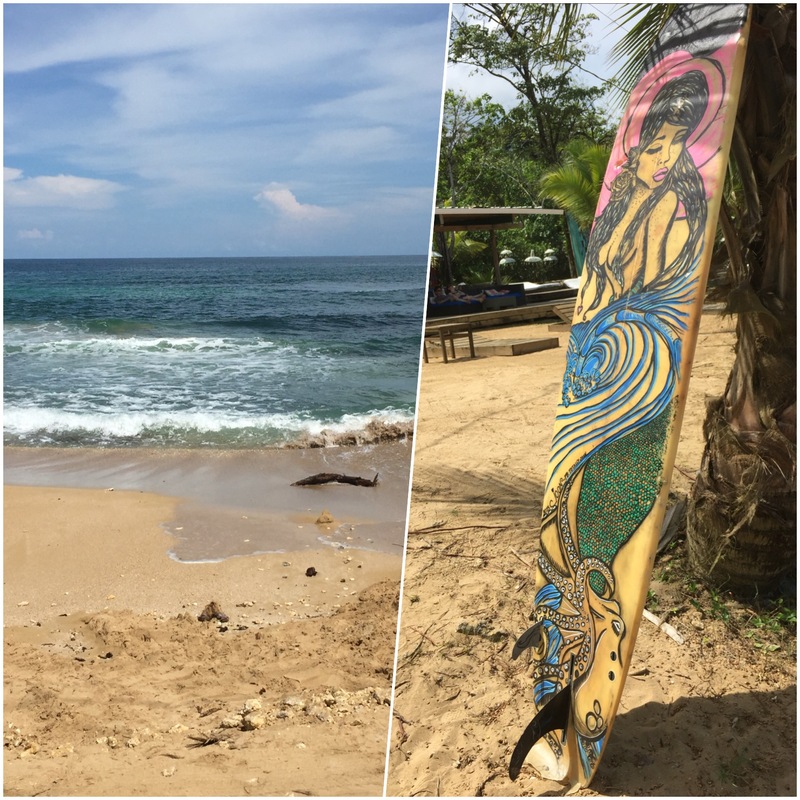 Bocas is renowned for its surf. Surf season officially begins in November. We just missed it. However, we enjoyed a four hour bike ride along the shore line the day before classes began. 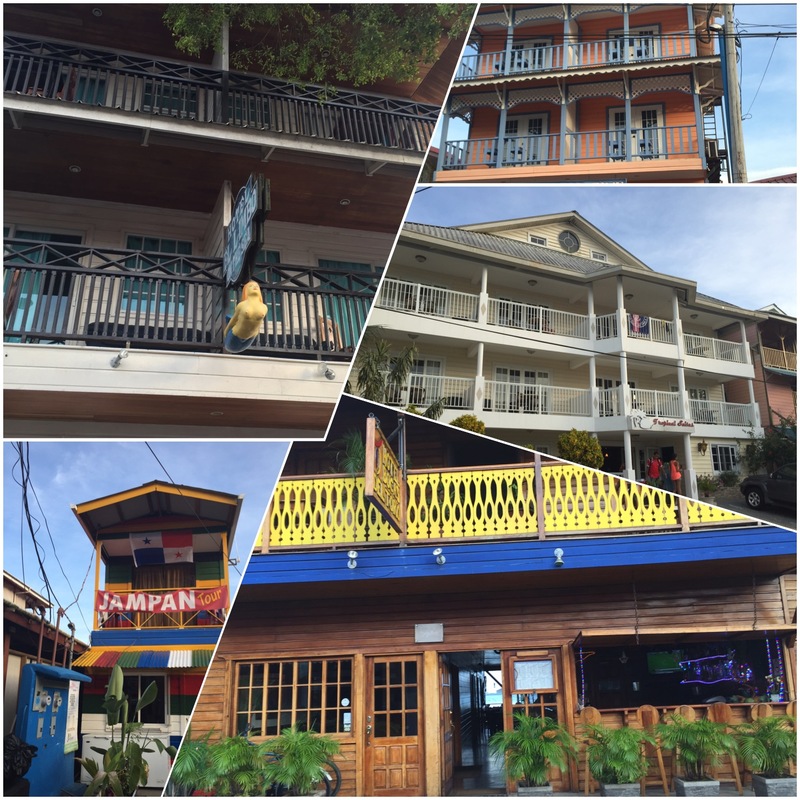 Downtown Bocas boasts a colorful streetscape full of attractive hotels and restaurants. After sunset the partying starts. But we were home doing our homework (not). 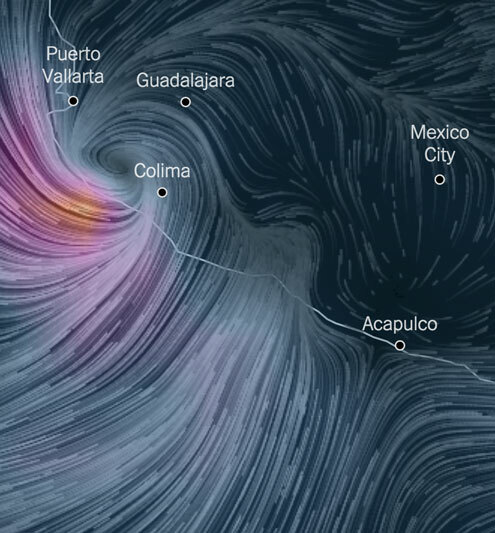 As we flew south Hurricane Patricia barged its way north. We appreciate folks inquiries regarding our safety. Fortunately, Patricia and we were on opposite sides of the continent. Patricia slammed Bara de Navidad, where we spent last Christmas. In Chamela, a small town we visited in 2014, Patricia leveled most wooden structures. Our visits to both towns occurred before or after hurricane season, illustrating why hurricane season is such a factor in each season’s cruising plan. The New York Times labeled Patricia as the strongest hurricane to “assault the Western Hemisphere.” The Times reported that Scott Kelly, the American astronaut aboard the International Space Station, posted a photo on Twitter of the storm with the warning: “It’s massive. Be careful! The Barra marina, the scene of many happy times for us, lived up to its reputation as a good place to ride out a blow. 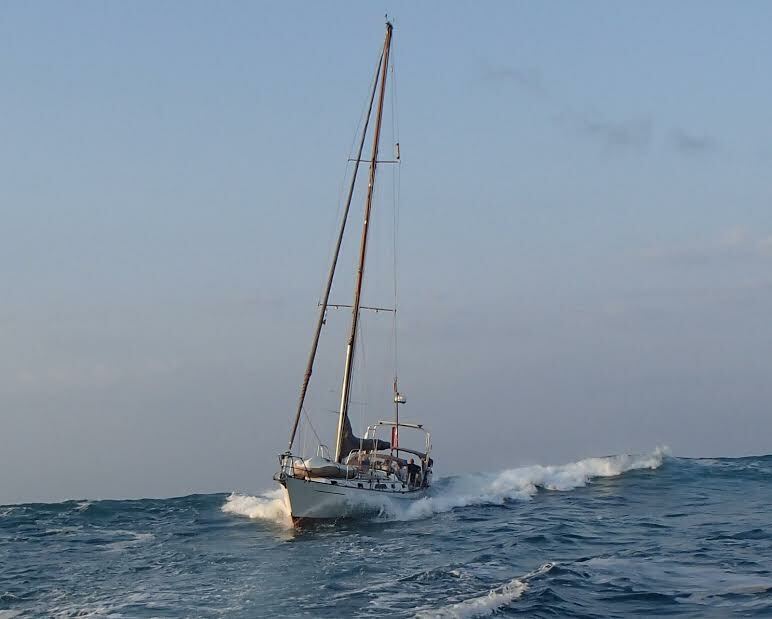 For those interested in a first hand account from cruisers staying at the marina, take a look at this blog from our friends on Sv Confidence. We share their hopes that our Mexican friends rebuild quickly and have a safe and productive season.